There are millions of writers working online delivering content for themselves or for their clients. A good writer is not necessarily an expert in the language he is writing in. What makes one – a better writer than others? It's the quality of copy he produces which is free of grammatical errors. No matter what editing application you're using, failing to proofread and correct the final copy may lead to poor results and annoyed clients. Fortunately, there are several extremely good and powerful grammar correcting applications one can use to refine and optimize written content. I use one of them to ensure I'm not introducing drastic errors in my copy, inadvertently. Depending on your exact needs and the way you write, you can select one or more tools listed below to easily churn out great content. Some of these apps are standalone desktop applications while others integrate with a web browser or with a content editor. Let's check out all these useful spell-checking applications one by one to augment our writing skills. 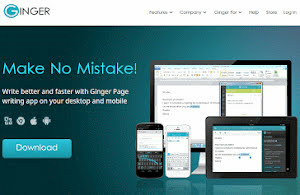 Ginger Software: Due to its versatility, I've included it at the beginning of the list. It's an all-in-one grammar and spell-check application with integrated editor. It can run smoothly on desktops, tablets, and smartphones including extensions for a web browser. It also has a powerful translator to let you convert your existing copy in over 50 widely used languages. It performs instant grammar checking as you type to make corrections in time before you get overwhelmed by too many mistakes. I also liked its text-to-speech module. Grammarly: I use this powerful grammar checking tool in the form of a browser plugin. It has an amazing free plan which is good enough for most writers. When using within a browser, it automatically activates itself within an active text field. The premium version of this tool can fix up to 250 different types of writing errors which are way more than the most sophisticated writing suite. I liked its context sensitive synonym suggestions to refine your writing by many folds. I liked its simple interface which provides easy point and click controls to correct the detected mistakes. WhiteSmoke: It's a versatile grammar checking and error correction application available both for desktop and smartphone. It can also translate text into over 45 languages. I liked the bundled writing templates which can be used instantly in any writing project. Like other smart solutions, it can work with any application which includes a text editing area. It can perform advanced grammatical checks with context-sensitive suggestions to fine tune the target article. It can also work like a charm with Microsoft Outlook application. Hemingway Editor: This editor, when combined with one of the grammar-checking tools listed above completes the writer's toolkit. Its powerful scanning engine gives accurate suggestions to improve the readability of the copy. With different color-coded text sections, a writer can easily visualize the pitfalls in the copy. It also gives a grade to assess the quality of the article. The statistics provided by this tool includes approximate reading time. Power users can also use this editor for HTML and Markdown documents.